Come see the new 2007 Sell-A-Bration sets! Clicking the words above will open up the Canadian SAB brochure (in .pdf format) and let you see the 5 great sets + the one Simply Scrappin' kit that will be available to YOU beginning January 1! When you spend $75 on Stampin' Up! merchandise, you'll receive a free Sell-A-Bration reward. There's no limit-for every $75 you spend, you can select another free Sell-A-Bration reward. When you host a workshop of at least $450 (before tax and shipping), you'll receive a free Sell-A-Bration reward-in addition to all of the regular hostess benefits! You'll receive a second Sell-A-Bration reward when your net workshop sales reach $900, and a third reward for workshop sales of $1350 or more! When you sign up to be a Stampin' Up! demonstrator, you can select any set (up to $54.95 value) from the 2006-2007 Idea Book & Catalogue-free! PLUS you will also get the new "Polka Dots & Paisley" set as an additional bonus... what are you waiting for? So come visit my Stampin' Up! business website to learn more about my super EARLY BIRD sale, only until January 5! On top of all the holiday mayhem of this past week, I also had to push and motor through to make 120 (yup!) cards for a Sell-A-Bration swap I was participating in. But not 120 all the same... no, I signed up for 4 different groups of 30+1 each. Yes, we all know I'm a masochist when it comes to swaps! But I do soooooo love having many wonderful cards to adorn my display walls of my studio to inspire my "gals" when they come over to play. 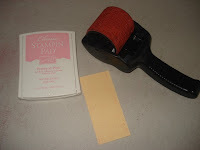 1) I used the "Rough Texture" Jumbo wheel in Pretty in Pink over a strip of So Saffron. 2) I adhered the strip to a quarter-sheet of Whisper White, and stamped the small flowers from Fresh Fillers in Pretty in Pink. 3) Using the 12x12 designer paper that came in the kit, I trimmed pieces down to go along the seam. 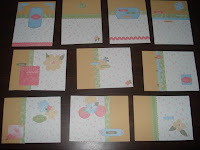 4) Then it came time to choose from some of the die-cut elements, to add to the cards. 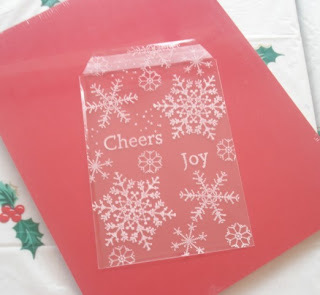 These are self-adhesive, so you just peel and place on your card or scrapbook page! 5) Last but not least, I added embellishments like the Soft Subtles brads and/or additional stamping from the SO Very SAB set. 6) Multiply by 30!!! Phew :) It was a bit challenging but I'm pleased with how they came out, and I still have tons from the kit left to play with myself. 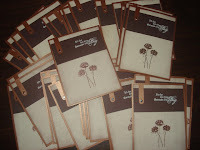 These are the 30 cards made with "Happy Harmony", using Brushed Copper, Chococate Chip & Naturals Ivory cardstock, ivory & copper EP, the Word Window Punch and vintage brads. The background is subtle, using the Aida Cloth background stamped in Close to Cocoa and with Chocolate Chip ink sponged around the edges. 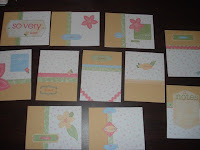 Then there were the 30 cards made with "Big Blossom", where I used a Stampin' Write marker and just coloured the edges of the stamp and stamped on the reverse of the pretty Rebecca Designer papers. 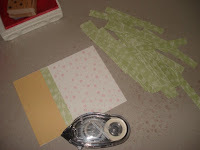 Cut them out and layered on Regal Rose and Sage Shadow, and used circle punches & clear buttons for the accents. Oh yeah, I also hand drew the stitching using a Sage Shadow marker and the "So Very" set for the word "sweet". Lots of cutting... lots of fun. Thank goodness for the Paper Snips! 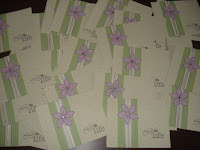 Last but not least were the cards made using "Delight in Life". I stamped one of the flower images out in Vintage Violet on Pale Plum cardstock, and cut it out. I layered it over strips of the Enchante paper from the Winter Mini catalogue, layered on Certainly Celery and accented with silver cord. I used a silver brad in the centre of the flower to help anchor it, and stamped the words on Naturals Ivory cardstock using the Vintage Violet again. 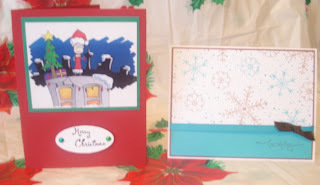 The background was stamped in Certainly Celery, using the little background detail stamp that came in this set. It's hard to see in the scan, but I coloured in the small flowers using Pale Plum and Certainly Celery. Lots of cutting again, sure, but I liked them! They've all been sent out to fellow Canadian demonstrator (DiAnne in Nanoose Bay, BC) for swapping, and I'll be getting back my 120 new cards to show you all in time for my big SAB Open House in early January! 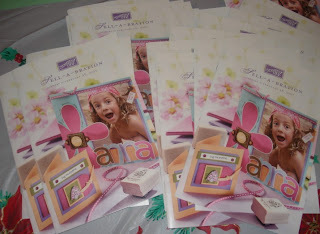 Win a FREE 2007 Sell-A-Bration Set! While Sell-A-Bration doesn't begin until January 1, I'm getting excited about it now and want you to be excited as well. So let's give away some FREE STAMPS!!! 3) Find the "Website Hidden Clue" on my Stampin' Up! business website and email me where you found it. Want a hint? think peaceful thoughts! Doing ALL THREE gets you THREE chances to win! All participants will be entered in a draw and at 9am on January 6, I'll get my daughter Serena to draw a name. Easy as that!! Stamping & club dates and classes.. oh my! 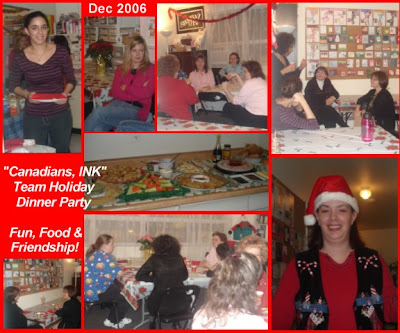 Now that the majority of holiday events are over & done with (it's been a wicked busy time here at the Kobayashi-LeBel homestead), I can start looking forward to some of the many 2007 stamping events I have already planned for you! 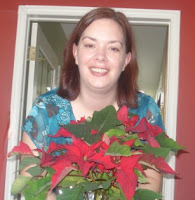 You can always visit my Calendar of Events on my Stampin' Up! business website, or click here for a complete schedule in .pdf format. During January I'll be hosting my 4th FREE Annual Sell-A-Bration Open House, holding another popular 10 card class (using the free SAB sets), having a "Sugar & Spice" Stamp camp using some of the popular Winter mini items, as well as having another Demonstrator Information Night. There will be 2 more stamp camps in February ("Carte Postale" and "Love Matters" from the Winter Mini catalogue) and another SAB 10 card camp, with ten NEW cards, of course. March brings another couple of great stamp camps (Hodgepodge Hardware & the Designer Punch Label box) and yes, for the card-making fanatics among us, another 10 card camp! PHEW! 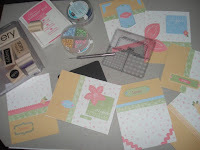 Add to that all the stamping parties & then my monthly Stampers Club dates and we'll be having a rockin' stampin' time. I'll be taking pictures of all the projects for upcoming events and posting them here first... for you to see! Last Chance at 50% off promotion! There's still just under a week to take advantage of Stampin' Up! 's great 50% off promotion. Feel free to contact me anytime for more information. I hope you'll enjoy these wonderful sets as much as I do! 8. Same for pies. Apple. Pumpkin. Mincemeat. Have a slice of ea ch. Or if you don't like mincemeat, have two apples and one pumpkin. Always have three. When else do you get to have more than one dessert? Labor Day? 10. One final tip: If you don't feel terrible when you leave the party or get up from the table, you haven't been paying attention. Re-read tips; start over, but hurry, January is just around the corner! In the spirit of the holidays, why don't you put aside all the baking, last-minute gift-wrapping & house cleaning for just a minute. I want to share a Christmas giggle with you! 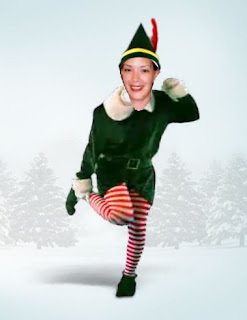 Clik HERE to see my Elfamorphosis (be sure to have your sound on). 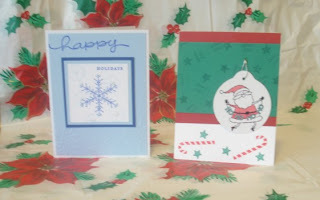 Click HERE to link to some of the holiday cards that were swapped at the Founder's Circle retreat that I attended back in September. 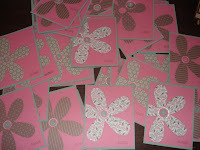 I received so many beautiful cards (including one from Shelli Gardner herself, the CEO and co-founder of Stampin' Up!) and it was just an all-around awesome trip. I'm in the process of starting to scrap my FC experience, and will share scans of my layouts when I'm done. I'm using the "At Home" Simply Scrapping kit and base colours of Sahara Sand, Chocolate Chip, Buckaroo Blue & Cranberry Crisp... looking pretty sharp so far! For now, here's a picture of me with some of my fellow Canadian demonstrators who also earned a spot at Founder's this year. When they announced our names at Convention in July, it was an unexpected surprise and the first year that Canadians were made eligible. The top 5 demonstrators in 3 different categories were awarded spots, and I was blessed to have placed in two of them: #2 in Team Promotions (Sr. Associate) and #4 in recruiting. I can't tell you what an honour and thrill it was to be with all these wonderfully accomplished & talented demonstrators, sharing this wonderful experience. 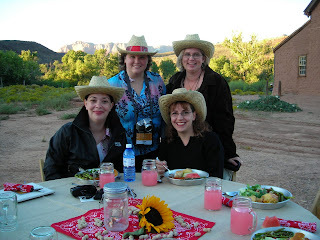 I met SO many lovely ladies, re-kindled friendships with gals I hadn't seen since the Mexican Riviera cruise as well as made a really special new friendship (love ya, Jen!!!). I'll be working my tush off this year to earn it again for next year, that's for sure. Here's a picture of me with Shelli and her daughter Sara. I'll never forget this trip and everything I learned... everyone was so generous in sharing what works for them and their businesses; I felt like a little sponge soaking it all up! 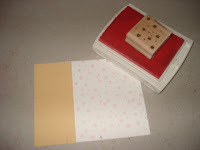 Chocolate & stamping... side by side! 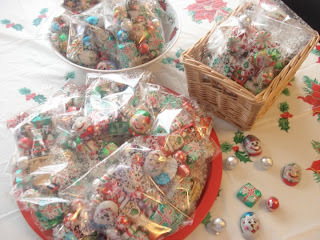 These are some of the little chocolate goody bags I made this week! I went to Bulk Barn and spent a hundred bucks on all kinds of Christmas-themed chocolates & candies and packaged them up to give out. 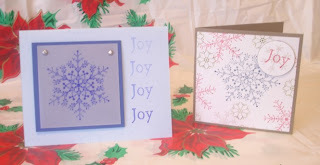 What I did: I used the new White Stazon ink and stamped on the clear translucent envelopes with "The Snowflake Spot". I *love* that Stampin' Up! added this to their product line this year... it's wicked cool! Anyhow, I then stuffed the clear envies with the candies and then just peeled off the self-adhesive strip to seal them up. Easy, peasy, love it! 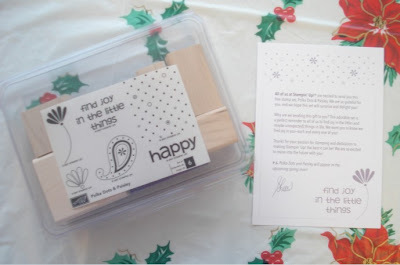 Merry Christmas to me, from Stampin' Up! 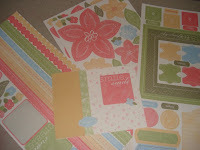 After much hype and anticipation, I received a most wonderful free stamp set from Stampin' Up! today: Polka Dots & Paisley :) All 50,000 demonstrators across the US and Canada are receiving this little lovely, because "this adorable set is a perfect reminder to all of us to find joy in the little (and maybe unexpected) things in life. We want you to know we find joy in you -- each and every one of you!" Isn't that just fantastic?? Man, I love this company! but BETTER YET... SU is going to be giving it FREE to all new demonstrators who sign up during Sell-A-Bration!! Who could resist??? You get to pick a free stamp set of any price from the catalogue as a bonus and now this too??? 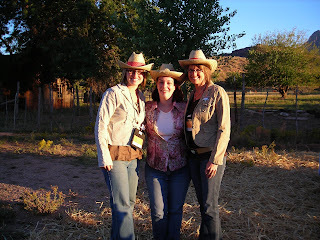 I'd love to have you join my team in 2007... click HEREto learn more about becoming a demonstrator with Stampin' Up! I said it before a million times and I'll say it again: I LOVE STAMPIN' UP!!!!!! Okay, I am often getting emails from friends about crazy and wacky YouTube videos, but this one truly made me LOL! As someone who has been scrapping for 8 years and completed over 20 albums, I can honestly say that I have NEVER made a page about the fruits I've eaten... hahahahaaaa! Although I have a great old retired Stampin' Up! set ("Fresh Fruits") which might do the trick! "Twas the week before Christmas", stamping-fashion! Save the stamping of rubber in a last-minute rush. In hopes that a greeting would soon be stamped there. But now it's ten-thiry....How'd it get so late? Had finally arranged all the stamping supplies. 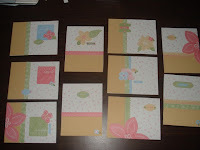 Just make a few cards for friends who are dear. A sprinkle of powder, heat to a sheen. 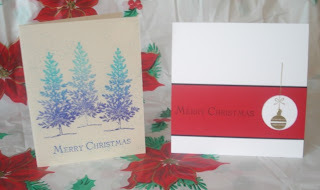 When what on my green Christmas card should appear? 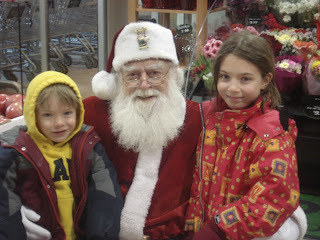 Why, a tiny gold Santa with sleigh and reindeer. On pigment! On powder! On heat from a gun! Now ribbon and glitter! Can I make eighty-one? And looked at the clock - 'twas well past midnight. I went straight to stamping out card after card. "This might take all night, but at least it's not hard". But after I finished, they looked a bit lame. I didn't want fancy, but these were too plain. And then in a twinkling, a thought came to mind. "I'll just dress them up, and then they'll be fine". Then back to the table with all that I'd found. And soon I was covered in emboss powder and glitter. The cap of my marker I held in my teeth. I'd lay in some colour or maybe gold leaf. My broad little face was all beaded with sweat. But I wouldn't give up - well, at not least yet. There was glue on the table and ink on the floor. I laughed at the site, though my fingers were sore. I did not complain, just kept up my work. When more things went wrong, I did not go berserk. It looked pretty good after all of my tricks. "I'm keeping this one, my work on it shows"
So clutching my card, up the stairs I arose. Creativity all spent, motivation gone. You'll all get your cards, but not till next spring! 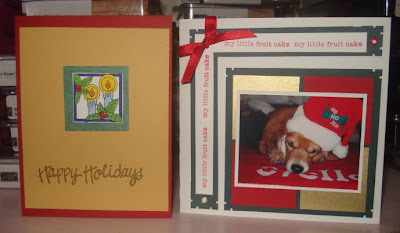 Look at some of the lovely holiday cards that I have received this past week. I know I have more to take pictures of, but those are at home already so I just have to bring the camera over and "clickety click" them for you.